Only a quick post this time! Carnival Divine do the most amazing posters! 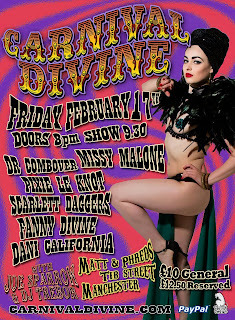 The line-up included the internationally renowned Missy Malone (seriously, just Google 'Best UK Burlesque Performer'!) 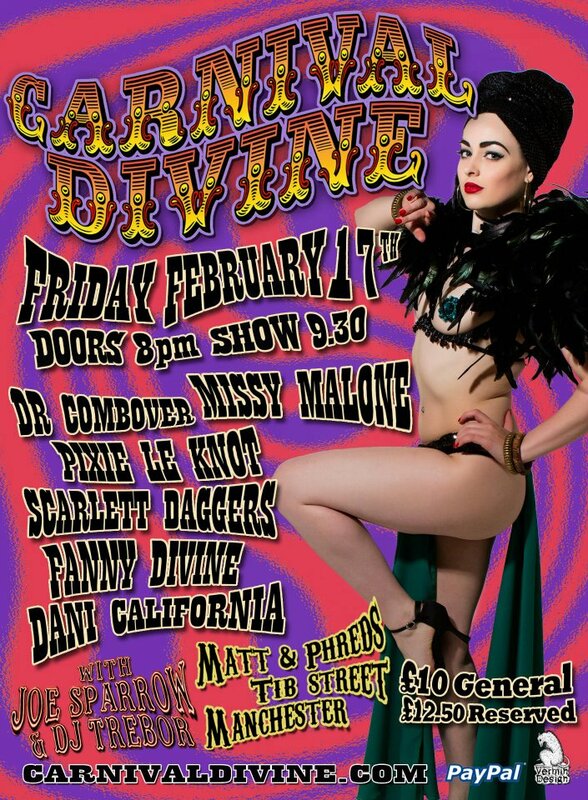 Scarlett Daggers (who's 'Kiss of the Cobra Woman' costume is actually incredible) Pixie Le Knot (one of the UK's most flexible contortionists! ), was hosted by the force of nature that is Em Brulee and of course, the creator of Carnival Divine, Fanny Divine - who looked as gorgeous as ever despite being stressed to the hilt, promoting, running and performing at the night! Backstage with Em Brulee, Fanny Divine, Scarlett Daggers, Missy Malone, Pixie Le Knot and Mickie the Maid! The night was a complete sell-out, and I heard rumours that people were even being turned away at the door to prevent overcrowding! The audience were amazing: to the point that I could barely hear the music for my 'Broadway Belle' act (from the moment I threw the glitter from my champagne glass, they went crazy for the next seven minutes!) and I've never had a response like it! I felt quite overwhelmed! I adore doing shows in the North West as it means I get to sleep in my own bed afterwards! A rare, post-show luxury in the life of a travelling showgirl!